5th. 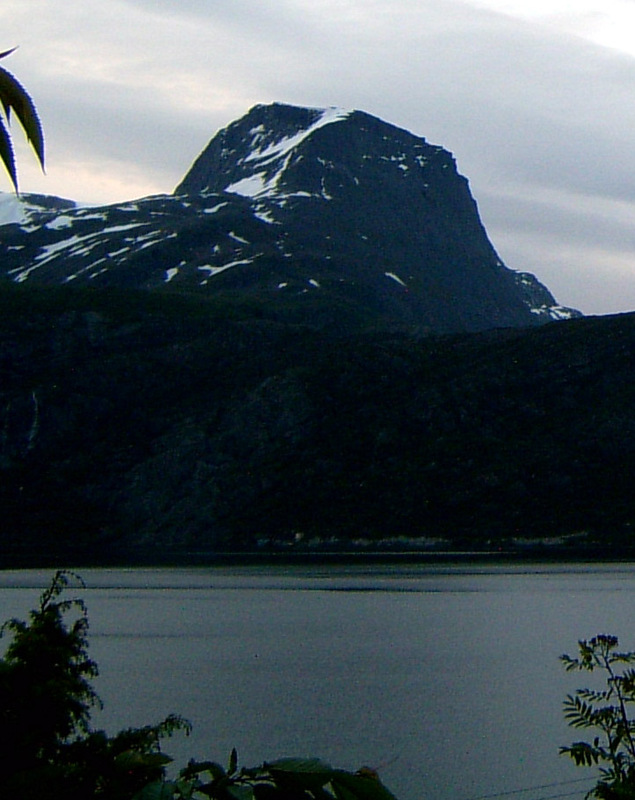 most prominent mountain in Norway. How to get there: The shortest trail starts from Hope. Hope is a bit more than 30 km west of Sandane along Hwy. 615. From Bergen, one should travel north on E-39 to Førde, then take Hwy. 5 north-west towards Florø. After a bit more than 35 km on this road, go north on Hwy. 615 at Storebru to Hope. At Hope, locate a small road with a sign for Gjegnabu. This road crosses the creek and can (in summer) be driven to a flat area where a sign tells you that further driving is not permitted. We parked just before the bridge a bit further down, this road is rather short anyway. Note, that due to the avalanche problems reported below, one may be better off with a longer, but less dangerous approach. 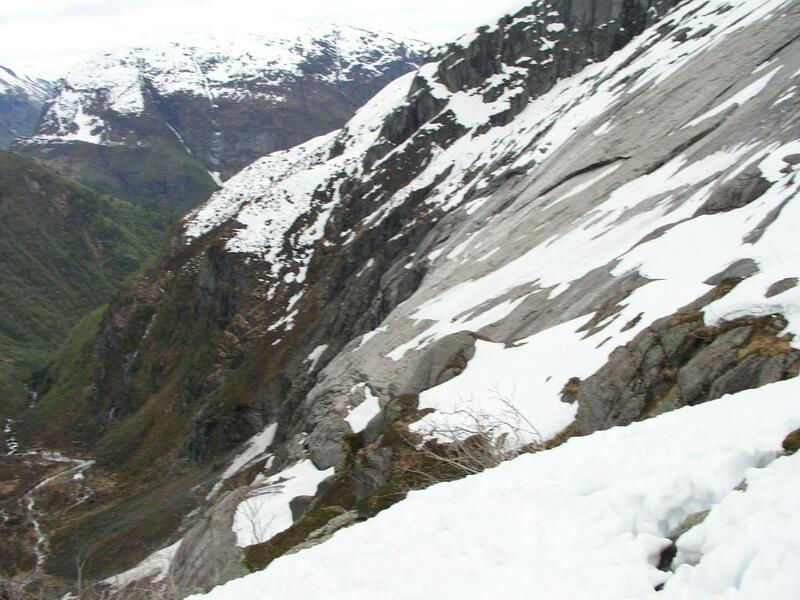 Route description: WARNING: The route described here is dangerous due to avalanche problems that cannot easily be judged from below. 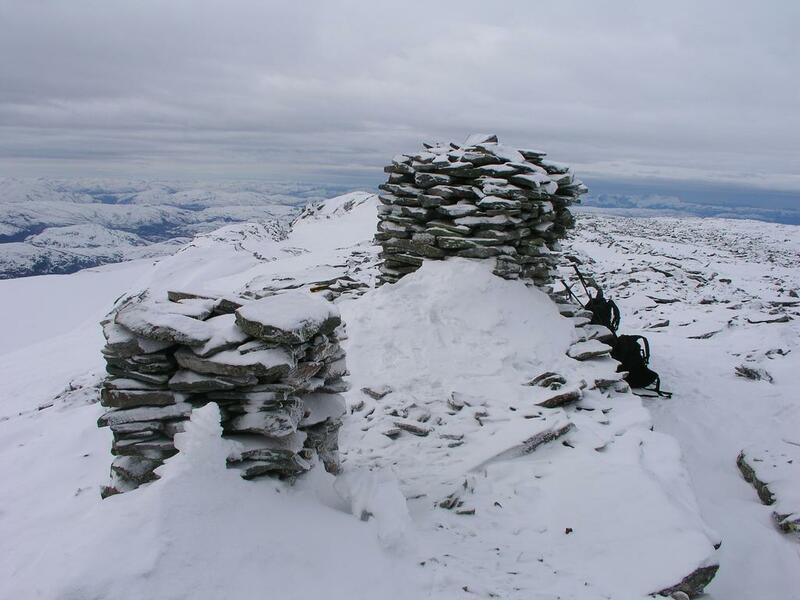 It is likely only relatively safe from mid to late summer and until the first snow in the fall. The marked route from Hope first follows the forest road along the creek into the narrow valley above. There is a forest road that forks left (see below), the route continues across a flat area where there is a sign saying that you may not proceed any further with your vehicle. Shortly thereafter the road ends and a small trail continues among trees as it climbs a bit higher than the creek before reaching a more level area where it again follows the creek. As you cross a small ridge you should have the rest of the valley in clear view. Stop and consider your future. The valley ends abruptly, on your left there are steep cliffs, similarly on the right. The trail starts climbing very close to the creek (on its left side) at the innermost part of the valley. 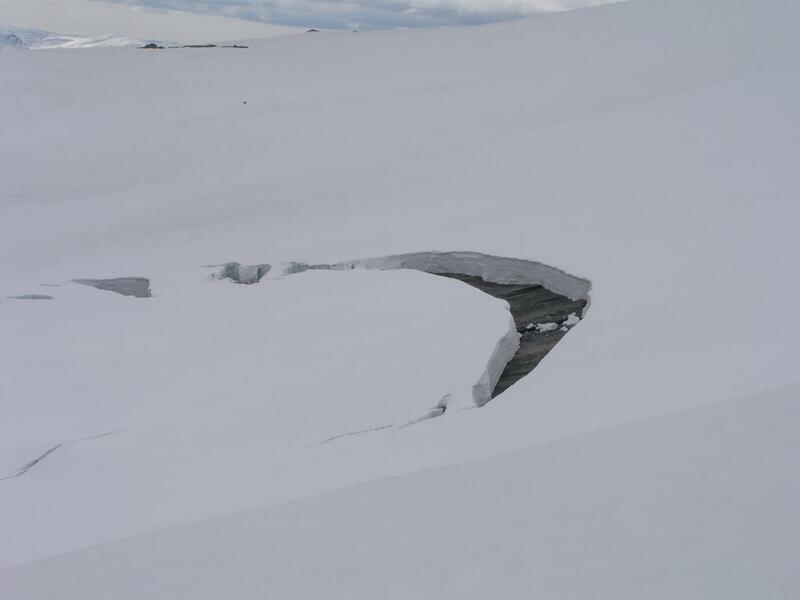 However, the marked trail runs on the left side and arcs over to this point possibly crossing some snow fields that are the result of avalanches from above. If there is ANY CHANCE that there may still be snow on the slopes above the cliffs (generally hard to see from below), then do not cross the snow, but proceed along the creek until you again locate the red paint on the rocks as the trail climbs steeply among cliffs just left of the creek. The route first follows the creek, then climbs very gently left on a grassy ramp. A bit higher, the route enters a rather narrow ledge that runs left to right when seen from below, along the cliffs on your left hand side. Higher up, you will see the creek coming down from a V-shaped, very narrow cut in the cliffs. The route bends sharply left on another ledge just before this narrow cut. This turn was only discovered by us during descent, and therefore never tried. Our route proceeded straight up along the creek, the last section being on the right hand side of the creek. 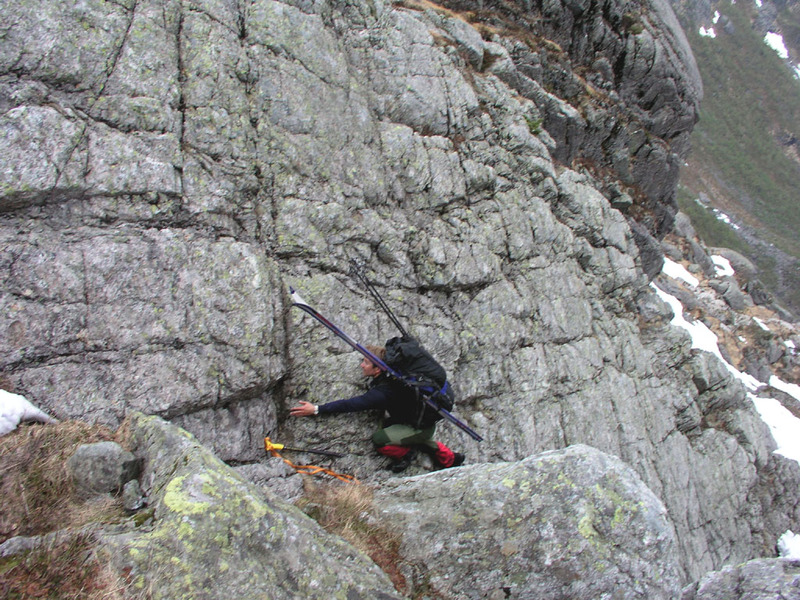 The lowest path is blocked at the upper end by a large rock. We finished this part by climbing on the steeply sloping rock making the right side of the cut. This climb was made slightly easier by some snow still present and partly covering the creek in the bottom of the crack. Still, this was definitely the crux of the climb. 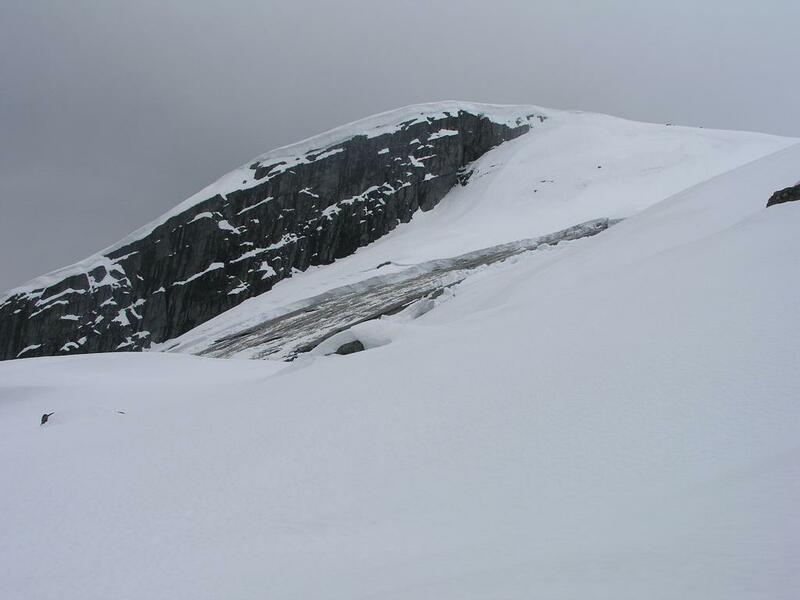 Above this difficult point you are at about 600 meter and there is a relatively level area here. This is the place to leave the valley. There is a fairly wide ramp going up to your left. The upper side of this ramp is a very steep and quite high cliff. This cliff continues uphill (only broken by a steep slope in one place) all the way to the small lake that is just before Gjegnabu. From the guest book at Gjegnabu as well as from a local farmer we met on our return hike, we learned about an alternative route (unmarked) that now seems to be preferred by the locals. As one follows the forest road up the valley, just before entering a flat area with fire wood, there is a forest road that forks left and climbs steeply up the hillside. This is the beginning of the alternate route. The route is called "Lavesteinen", from the view of a (special?) rock that can be seen higher up. However, this route is also steep and avalanche prone. As we never checked it out no recommendations can be made. Check carefully before launching. Comments: I made this climb with my friend Arnt Flatmo. We hiked in the valley and followed the red paint marking until we lost it just below the 600 meter level. 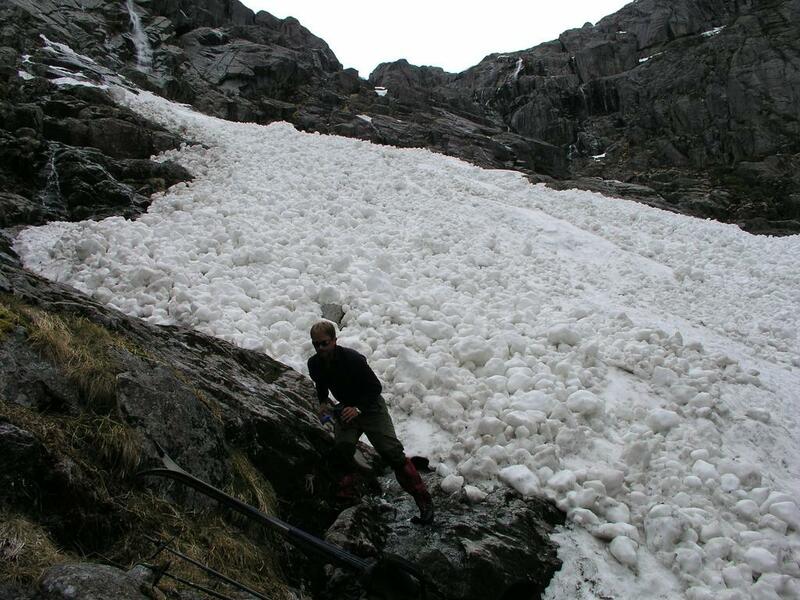 A huge avalanche released on a surprisingly gentle slope to the left of our route at the 800-900 meter level. This avalanche proceeded down towards the steeper slope below and then straight off the near vertical cliffs near the valley floor. It hit violently and vertically directly on the path (red marked) that we had walked about 1.5 hours earlier. First lesson: this approach should not be used in April. Second lesson: if here at this time of year, leave the trail as it approaches the last part of the valley and continue to the beginning of the slope (where the creek comes down) along the far right side. The fact that there is already a (possibly huge) deposit of avalanche snow on the left slope DOES NOT imply that there will not be more coming. Gjegnen, as seen from the north. 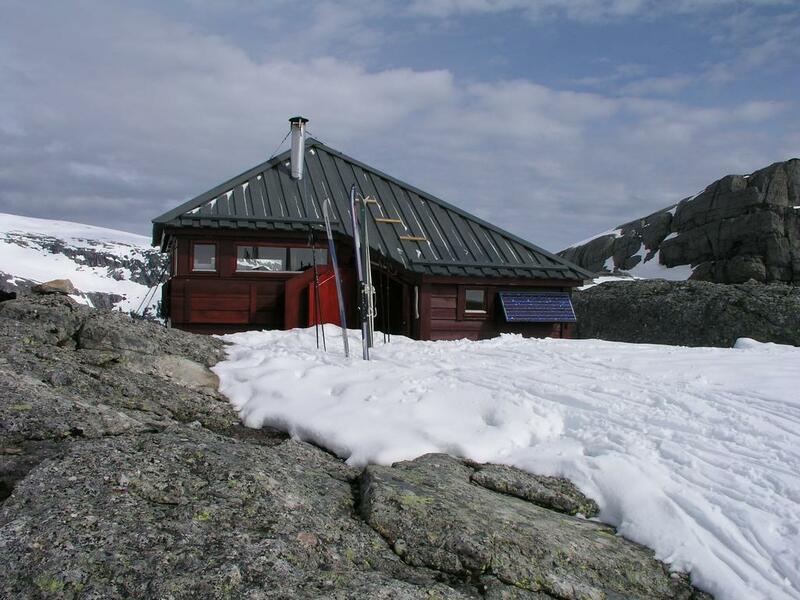 This picture has been provided by Jan Torheim and is taken in June 2004 from Torheim in Nordfjord. 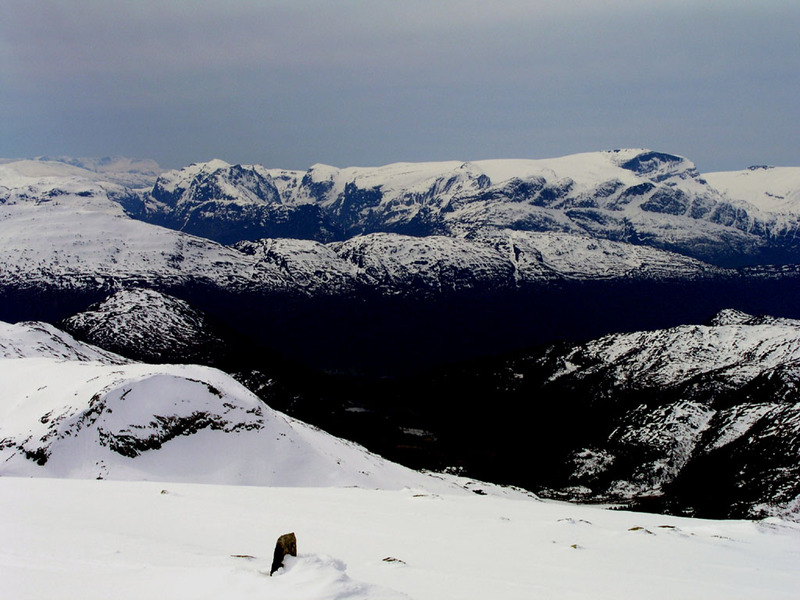 Gjegnen, as seen from Eidskyrkja. 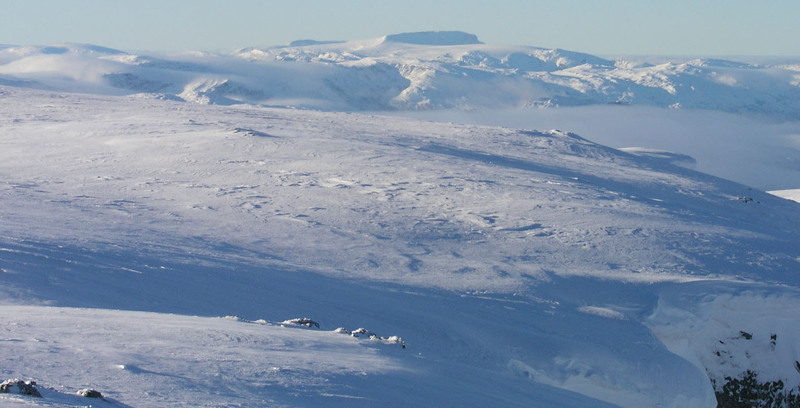 Gjegnen, as seen from Storfonn, November 6, 2004. The route, zoom to see details. Note that the lower part avoids the avalanche area. From the point of the trail where this picture is taken, one should check the snow conditions high up on the left. A major avalanche released AFTER we passed down below. That is, as it looks on this picture, the situation is NOT safe. Arnt on the crux of the ascent to Gjegnabu. Just gone, notice how flat it is, but the rock below is just very smooth. The avalanche path is steeper further down. Where it all ends, right on top of the red marked trail. 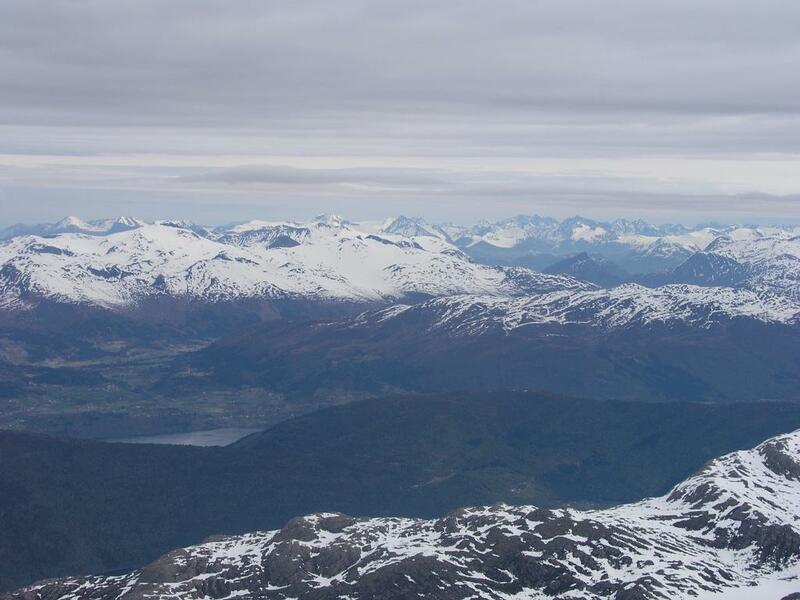 View north from the summit, Saudehornet (left) and the characteristic triangle shape of Vassdalstinden (right) are both in the center of the picture. Kolåstinden can be seen further right. The two peaks in front of Saudehornet are Trollvasstinden (left) and Bytingstinden (right). View north-east from the summit.